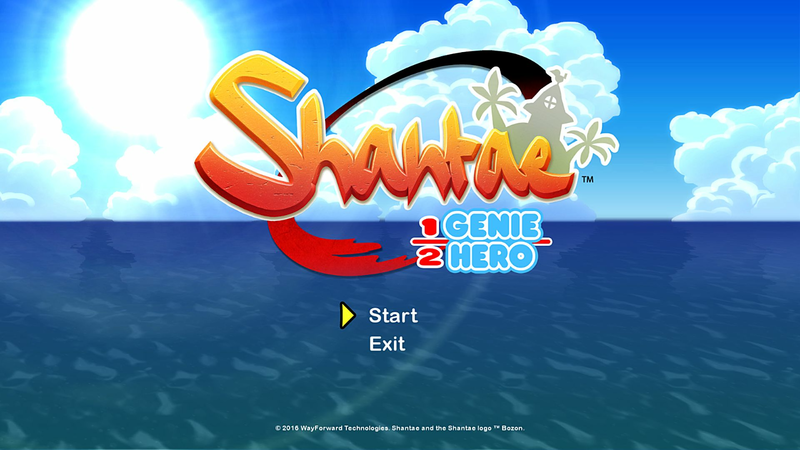 Shantae: Half-Genie Hero is the fourth installment in the long-running Shantae series, and comes to us from WayForward Technologies, the venerable independent developer responsible for games like Double Dragon Neon, DuckTales: Remastered and A Boy and His Blob. 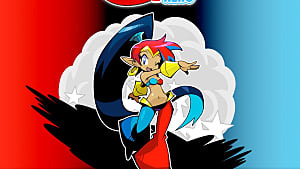 The physical versions of Half-Genie Hero were also published by XSEED Games (now known as Marvelous USA). The game was a product of a Kickstarter by WayForward launched back in 2013, and it surpassed it's goal of $400K with a total of nearly $950K while also reaching most of its stretch goals. It is the first entry in the series made for consoles, and likely set to be the largest in the series so far, with two main campaigns to play through and character DLC coming later down the pipeline. The questions are: Has this jump to more advanced tech benefited the series, can it surpass the previous entries in the series and was the Kickstarter success warranted? Let's dance through the danger and find out. 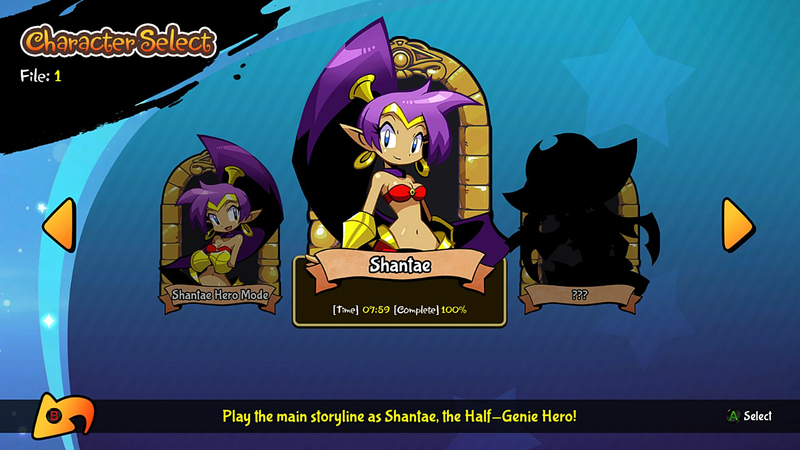 Shantae: Helf-Genie Hero is, like the three previous games in the Shantae series, a 2D Platformer with elements of Metroidvania. You jump around, collect items and whip enemies with your hair as has always been the case. There are five main worlds to tackle, all linear platforming stages loaded with secrets and collectibles, and there is a hub-world in the form of Scuttle Town, where you go to buy items, talk to people and further the plot in between levels. 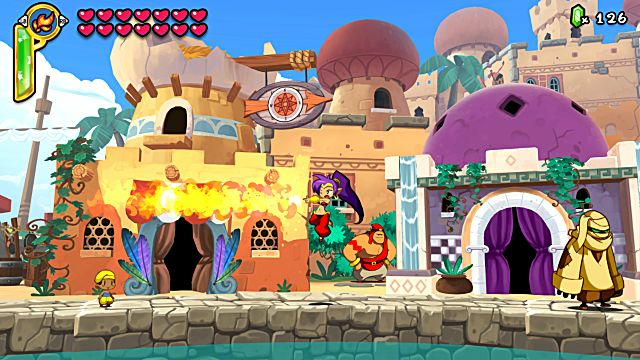 Like previous installments, Shantae: Half-Genie Hero involves a lot of exploration, item collecting and backtracking. 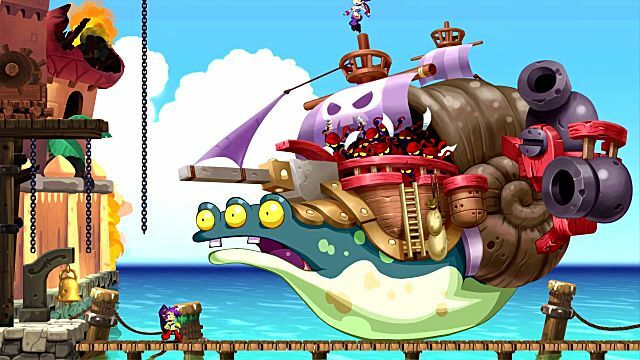 The game's world as a whole is similar in size if slightly larger than that of Shantae and the Pirate's Curse, which means it's decently sized and packed with secrets. But thankfully, big changes have been made to traveling in Half-Genie Hero that make back-tracking much less of a hassle (see below). From Scuttle Town you travel to the world map where you then choose where you want to go among the levels you've unlocked, and you also get a tally of how many of the hidden collectibles you've found in each level, so you can easily track your progression. Shantae and Sky selecting a stage on the World Map. You are also given a whistle near the start of the game that allows you to exit any level at any time and take you back to the World Map. This removes the need for backtracking to town that was handled less effectively in the previous titles. Each level is divided into segments, each separated by a save screen that acts as a checkpoint if you get a game over. In addition to the whistle, you also get access early on to a dance that allows you to warp between the starts of the segments of levels you've already completed. This makes traveling around Sequin Land easier than it ever has been, not to mention more enjoyable. 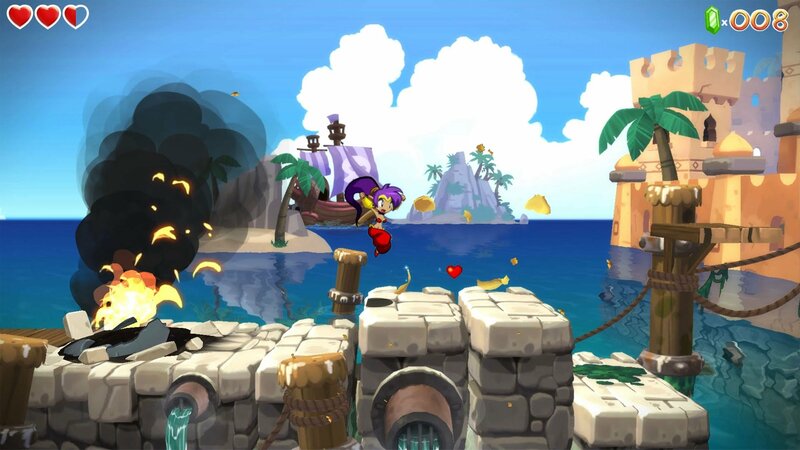 In terms of mechanics, as is typical of the Shantae series, WayForward nails the basic and introduces great new elements while ditching the older, more negative ones. The controls are enjoyably tight and responsive, and the strategies and abilities required in the diverse array of situations that the game presents allow for constant variety in challenge and gameplay. One moment you could be leaping between flying carpets in a brief auto-scrolling level that ends with a boss fight against two airships, and the next moment you could be going on a quest for a sword to give to some snooty guy in order to get a silly hat for an elderly Blobfish (no, seriously). Shantae using the fully upgraded fire spell - The flamethrower. 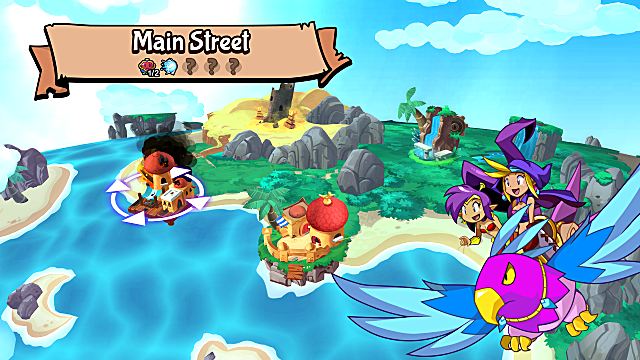 And while the levels are, somewhat disappointingly, the typical selection of Shantae locations with only a few surprises, they are still visually diverse as well as excellently designed around Shantae's basic abilities. On that note, returning from the first two Shantae titles are her magical transformation dances, which allow her to transform into a wide assortment of animals. 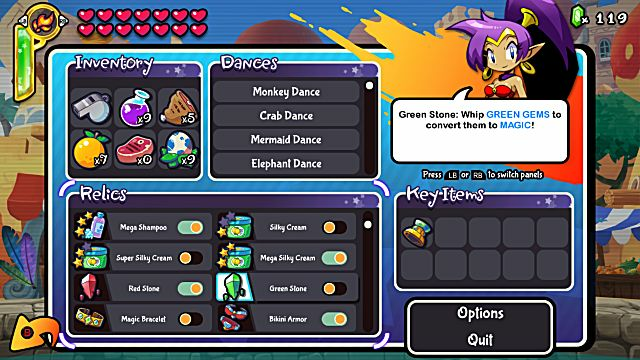 Throughout the course of the story campaign, Shantae is rewarded with a new animal transformation at the end of each chapter, as well as a few optional ones available for purchase and some scattered around the world. These all provide her with new abilities to bypass specific obstacles and do things that the vanilla Shantae cannot. These range from classic fan-favorites, like the high-jumping gap-shooting monkey, to new transformations such as the crab for underwater platforming and secret searching, and the mouse for navigating tiny maze-like passages. 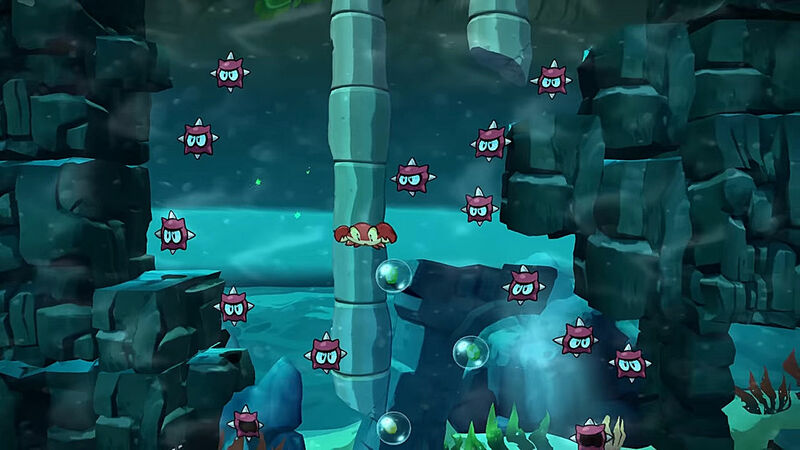 Crab Shantae gently floating between exploding mine enemies. Additionally, there are many different upgrades for these forms (both optional and required), and the act of finding and using them all when they're needed just adds another layer of enjoyment to exploring the world. Admittedly, some of these abilities don't end being used very often and could have been fleshed out into more major mechanics, but even then nothing is useless and everything is utilized to its full potential at least once. The largest change to Half-Genie Hero's gameplay from the previous titles in the series is in the form of the new customizable magic and relic system. Returning from Shantae: Risky's Revenge are the magic bar and staple magic attacks, such as the storm puff and bubble shield. These optional in-game purchases allow Shantae to attack from a distance in a variety of ways or defend herself from different forms of attacks. They also all each have a number of upgrades that incrementally make them all progressively more powerful and diversified. On top of these magical attacks, there are a number of helpful relics that act as power-ups that can be both found and purchased throughout the game. Their uses range from speeding up the time of your transformation dances to reducing the damage you take by half. But the truly interesting thing about them, that also works in tandem with the magical spells, is that they are completely optional, and can, in fact, have their effects switched on and off from the pause menu. Managing relics on the pause screen. This offers both a great deal of customization in how the player wants to upgrade Shantae and approach combat and acts as the game's difficulty settings. While Half-Genie Hero is not an easy game, it is rarely ever very hard, and so those looking for an additional challenge will be expected to impose it on themselves. By enabling some relics, or by going out of their way to avoid health upgrades, the player essentially chooses their own difficulty level. If you so desire, you can collect all upgrades and steamroll the final boss like you've got cheat codes on, or you can ignore them all and struggle through an immensely challenging yet rewarding campaign. The choice is yours. 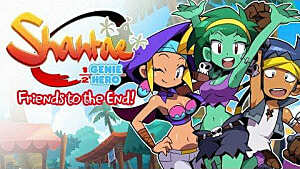 Aesthetically speaking, Shantae: Half-Genie Hero is clean, cute, colorful and charming in its craftsmanship. The use of 2D hand-drawn characters in the foreground against 3D environments is effective at creating a distinct look, and it does a good job of bringing the classic pixel aesthetic of the series' past into a new cartoonish style. Shantae fighting Tinkerslug, the first boss. As is typical of WayForward, the animations are impressive and fluid, the characters are all emotive in their actions, and the whole world feels alive through the simple details of things like rising chests and rustling clothes. The writing and dialogue are also as strong as ever. The conversations between characters can range from serious to confrontational to often outright hilarious, which makes all the characters feel unique from one another as well as add to the game's immersion factor. 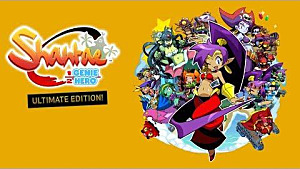 Half-Genie Hero's soundtrack is done, once again, by series-veteran composer Jake Kaufman. Each track is perfectly fitting for each stage and important story moment (it might even be worth shelling out some extra cash for the "Risky Beats" edition of the game that comes with the soundtrack on CD). 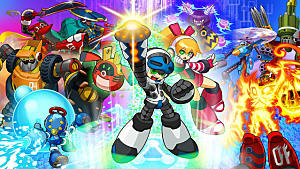 The soundtrack is less midi than previous games' and actually utilizes a variety of real instruments, from saxophone to bass guitar, and occasionally mixes the two genres together to create a very unique sound. The story of Half-Genie Hero is nothing amazing as far as platformers go, but it still has plenty of charming and comedic moments, with a few bits of characteristic tenderness sprinkled throughout. While there is an overarching goal that moves the plot forward, involving Shantae collecting parts for her Uncle Mimic's new invention, each world and their respective required visit back has their own villain to defeat and conflict to conquer. All of these elements, combined with the colorful hand-drawn visuals, makes each of the main chapters feel like an episode of some sort, like a Shantae cartoon show. 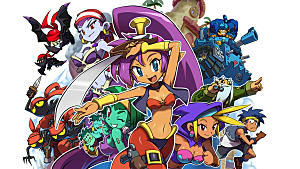 This does mean that the story is a bit less rigidly structured and character focused than Shantae and the Pirate's Curse, which may be disappointing to some fans, but rest assured that the plot is still solid and gives a decent amount of attention to Shantae's friends, as well as peanut gallery of newcomers. On top of this, the game runs flawlessly even on low-end PCs, allowing the smooth graphics and animations (with a buttery frame-rate) to be enjoyed by nearly anyone. An average player could likely beat Half-Genie Hero in around 5-6 hours -- if they weren't going out of their way to collect everything -- while players going for 100% might take upwards of 7 hours. The overall length of the game isn't bad, as the story is fully told and the mechanics all fully explored within that time, but as a sequel, it's a bit pokey. 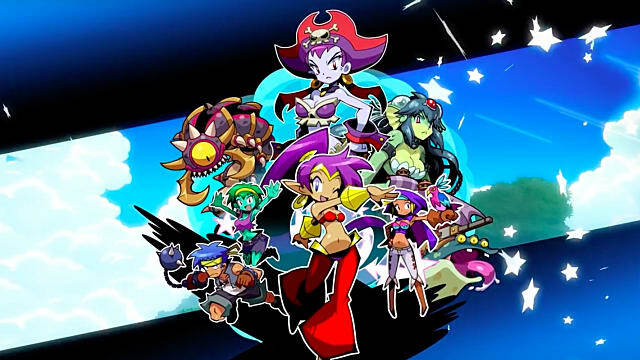 The previous installment Shantae and the Pirate's Curse was only slightly shorter in an average playthrough, but as a sequel made from the ground-up for consoles, it only seems right that it would be noticeably larger. Then again, seeing as how this is almost certainly due to how much funding the main campaign got through the Kickstarter, it can't really be helped, and it would be unfair to call it an oversight. 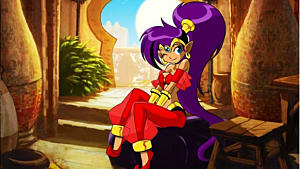 Shantae creator Matt Bozon has stated that unmet stretch goals from the Kickstarter could be added later if the game does well enough, but it's just a possibility and only time will tell. 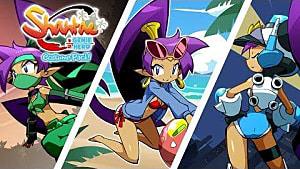 This criticism may also end up becoming moot in the near future, as WayForward does have a free campaign planned for Shantae's arch nemesis in the works. Her campaign will supposedly utilize entirely new mechanics in the form of "tinker tools" that function similarly to the upgrades in Shantae and the Pirate's Curse, will be about as long as Shantae's campaign, and will be a free update. On top of that, due to hitting their $900K stretch goal, WayForward will also later be releasing shorter campaigns for the characters Sky, Bolo and Rottytops, all of which will have their own storyline and unique gameplay mechanics. However, unlike the Risky Boots campaign, these will be released as payed DLC. As of this writing, no price or release date for them has been announced. Half-Genie Hero is a prime example of a Kickstarter-funded game that actually lived up to the excitement it generated, rather than disappointing fans and the general public with an unimpressive product that we could have simply gone on living without. It's a game that's clearly a labor of love, as evidence has shown each Shantae game has been, and WayForward's passion for their work is something they wear on their sleeves. Shantae: Half-Genie Hero is a splendid 2D Platformer packed with enough charm and new ideas to make the 6-7 hours it will take to beat it worth every second of gameplay and every dollar spent. Judging it solely on what content is present at the moment, and ignoring, for now, the promises of what's to come, Shantae: Half-Genie Hero is worth your time and money if you're looking for a great 2D platformer -- or just a fun game in general. Shantae: Half-Genie Hero will be available for digital download on December 20th for Wii U, Xbox One, PS4, PS Vita, and PC. Physical copies of Half-Genie Hero will be available for PS4 and PS Vita on December 20th and for Wii U on December 27th. You can also check out the game's official website for more information. After nearly three years of anticipation following the success of it's Kickstarter, Shantae: Half-Genie Hero shows us why it was worth the wait. Mega Man-ipulation: Mighty No. 9's $4 million budget went.. where?